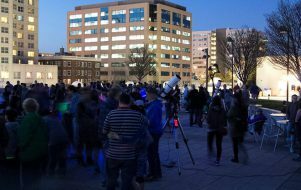 Join members of the Madison Astronomical Society (MAS) for the spring “Moon Over Monona Terrace” event on Friday, April 28, 2017 from 7:00-9:30pm (weather permitting)! We’ll have telescopes of all kinds set up on the rooftop and will be able to view the Moon, Saturn, Mars, galaxies, star clusters, and more! It is a family friendly event.